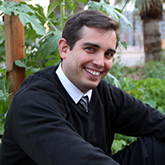 Braden Kay is the director of sustainability for the City of Tempe. He was recently the sustainability project manager for the City of Orlando, where he led sustainability implementation in waste diversion, urban forestry, and urban agriculture programs. He received a PhD from Arizona State's School of Sustainability for his dissertation work on stakeholder engagement and strategy building within the City of Phoenix. Previously, Braden managed community engagement, sustainability assessment and strategy building for the City of Phoenix's Reinvent Phoenix grant, which is funded by the U.S. Department of Housing and Urban Development's Sustainable Communities program. Braden's academic and professional experience in urban planning, sustainability assessment, and sustainability implementation make him an asset for innovative urban sustainability efforts. Foley, R. W., A. D. Wiek, B. Kay and R. Rushforth. 2016. Ideal and reality of multi-stakeholder collaboration on sustainability problems: a case study on a large-scale industrial contamination in Phoenix, Arizona. Sustainability Science 1-14. Broomall, B., A. Xiong, N. Mandrell, B. Kay and A. D. Wiek. 2012. Fostering partnerships for a healthy downtown Phoenix. Presentation at the Building Healthy Lifestyles Conference, February 12, 2012, Arizona State University, Tempe. Foley, R. W., B. Kay, R. Rushforth and A. D. Wiek. 2012. Can nanotechnology decontaminate water in a morally contested context?. Presentation at the 16-18 May 2012 International Symposium on Sustainable Systems and Technology, Boston, MA. Wiek, A. D., L. Withycombe Keeler and B. Kay. 2011. Operationalizing urban sustainability transitions with transformative governance: Results from participatory sustainability transition planning. Presented June 14, 2011 at The Second International Conference on Sustainability Transitions, June 13-15, 2011, Lund University, Lund, Sweden. Wiek, A. D., L. Withycombe Keeler and B. Kay. 2011. Sustainability transition research in a city of the "American Way of Life". Presentation at the 2nd International Conference on Sustainability Transitions (IST2011), June 14, 2011, Lund University, Lund, Sweden. Wiek, A. D., C. Johnson, B. Kay and J. Zonn. 2010. Transition strategies for urban sustainability. Presentation at the American Planning Association, Arizona Chapter, State Planning Conference, November 3-5, 2010, Phoenix, Arizona.